After a painful period which Jongkind had preferred to spend in his native land, the artist returned to France in 1860, marking the start of a highly creative period. He travelled to the Norman coast, where he met Boudin and Monet, and worked and painted in Paris. He also composed a number of Dutch scenes from memory or from sketches, a subject to which he remained faithful throughout his life. The towpath painted here was situated near Overschie, if we consider the outline of the church tower, on the left-hand side of the painting. The artist had already depicted this motif, in the picture of the towpath near The Hague painted in 18591, whose composition is already rather close to the one analysed here. On 27 February 1865, the artist confided to the dealer Beugniet: "I have just finished for you the small painting, of The Moonlit Overschie Canal near Rotterdam, Holland." No doubt he was talking about this work. In 1865 Jongkind produced views of Holland, of Paris (Bercy, boulevard Jourdan, Ourcq canal, Bas-Meudon.) and of Honfleur, where he spent part of the summer. The majority of those paintings shows the same composition, and it is the one chosen for this Towpath near Overschie. The bottom third of the painting is taken by the landscape, and the two upper thirds by the sky. The scene is divided in bands converging towards a vanishing point here placed on the left. This organisation of space was inherited from traditional Dutch painting, which Jongkind had learned from his master Andreas Schelfhout. To give height to these converging bands, Jongkind distributes vertical lines of various heights: a decreasing line of trees on the right and the Overschie bell tower on the left. Between these dynamic lines there is a dense and earthly balance which breaks the fluidity of the sky and of the water reflecting the moon. In Jongkind's oeuvre, this composition was a permanent feature which sometimes became an obsession. A view of Delft of 1844 already adopted this division of converging areas between earth and water, as in Towpath near Overschie. 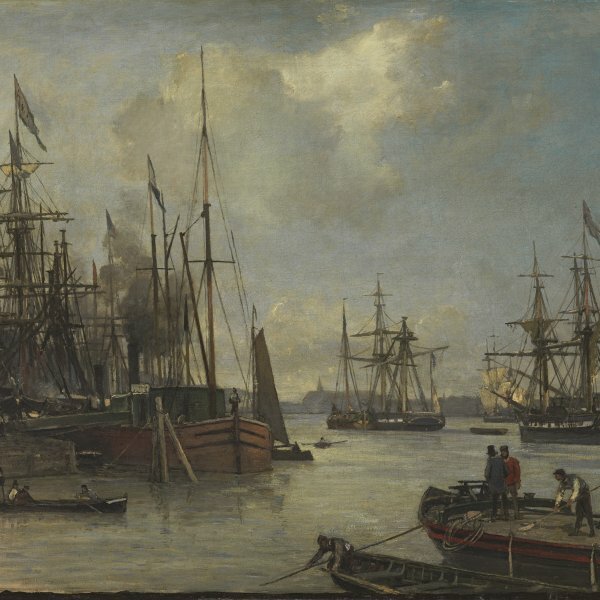 In Honfleur, Jongkind represented many times the seafront and the pier, using a composition very close to the one we have just described. And again, he shows this division of space in the views of the Ourcq canal in Paris. there are plenty of examples. The other permanent feature in his work is the similar formats used for his paintings, including the one adopted for Towpath near Overschie. This repetition could lead to a certain degree of weariness, but this would not take into account the feeling of magic about many of Jongkind's works. Towpath near Overschie is a superb example of this. 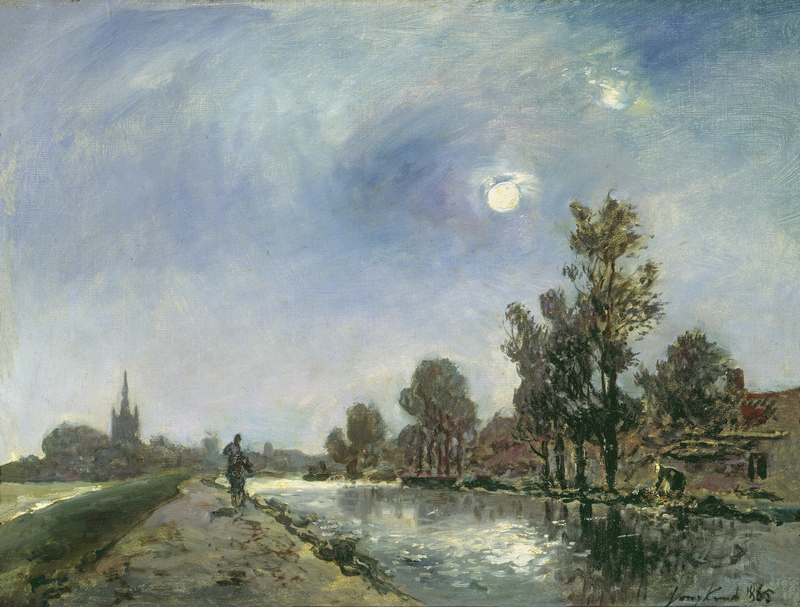 The viewer's eye is attracted by the silvery sheer of the moon and of its reflection in the water, which reaches, in a ray of light, the water near the church of Overschie on the left and, on the right, the figure leaning close to the bank (a washerwoman?). Where the sky and the land meet, a soft halo sets off the dark outlines of the trees and of the church, thus increasing their sense of presence. The sky is depicted lightly, like a gouache, with large apparent brushstrokes, and contrasts with the dense landscape, painted with short nervous strokes, sometimes heavily laden with paint. But this density is only apparent, as the painting is not applied regularly on the canvas. Jongkind often lets the clear grain of the support show through, punctuating the work with pauses which emphasise the artist's language. The quality of the work is not immediately perceived by the eye, it has to be slowly uncovered and deciphered in order to convey its emotion.